Hunted, trapped, shot…Scotland’s foxes are in trouble. This Christmas, please help us protect them. 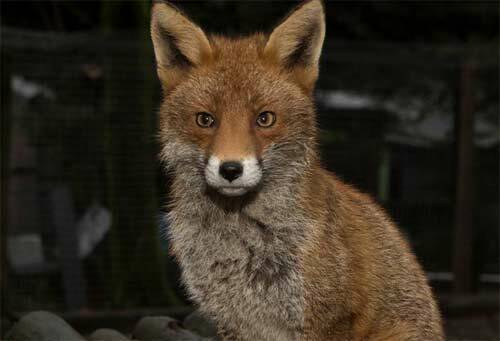 For many years, OneKind and Hessilhead Wildlife Rescue have been working to save Scotland’s foxes in different ways. Now we’ve decided to come together in 2017 to fight back against the persecution of this inspiring animal that we’re proud to protect. We believe foxes are wildlife, not vermin. They should be respected, protected and enjoyed, not hunted, trapped and shot. Support our Save Scotland’s Foxes Christmas appeal, and your donation will go straight to OneKind and Hessilhead Wildlife Rescue’s work to protect Scotland’s foxes. We hope you will give generously to this groundbreaking partnership this Christmas. Save and rehabilitate injured foxes and release them back into the wild. Campaign to end fox hunting and snaring. Work to change the public perception of foxes: Foxes are wildlife, not vermin. Donations will be shared evenly between OneKind and Hessilhead Wildlife Rescue. All donors will be invited to an exclusive event at Hessilhead next year to celebrate our work to save Scotland’s foxes. Snares are wire noose traps that are used extensively across Scotland to catch foxes. Once caught, they can cause a slow and painful death. For over a decade, OneKind has been campaigning against snares, and Hessilhead has rehabilitated many foxes saved by animal lovers from the grips of these horrific traps. In 2017 we will work to end snaring for good whilst continuing to rescue and treat snaring victims. 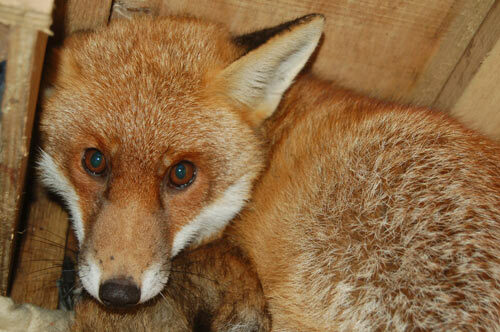 This fox was saved from a snare in November and is now recovering at Hessilhead Wildlife Rescue. 800 foxes are killed by the hunts in Scotland every year. In November Hessilhead were handed the dead body of a fox that had been hunted with dogs. OneKind arranged for a post-mortem that revealed the poor animal had suffered a prolonged and painful death. Next year we have a huge opportunity to ban fox hunting, but need your support if we’re to give Scotland’s foxes a voice. McDonald was found on a patch of grass near Glasgow City Centre. He was cold, his placenta still attached. McDonald’s mother must have been disturbed while giving birth. It was amazing that the cub was found in time to save his life. McDonald was given round the clock care at Hessilhead, having two hourly feeds when he was very small. Although we tried not to tame McDonald, he learnt to trust people and associates people with kindness. This means that McDonald cannot be released. He lives at Hessilhead with another fox. He is very friendly and playful, and enjoys being an ambassador for foxes. OneKind and Hessilhead have worked together on a range of issues for a number of years. This winter we come together once more to fight back against the persecution of this inspiring animal. If you are a UK Taxpayer, under the Government’s Gift Aid scheme OneKind can claim the tax you have already paid on your donation. This means that your donation can increase in value by at least 25% at no extra cost to you. Please tick the box below if you would like OneKind to claim the tax on your donation. I confirm I have paid enough income tax or capital gains tax for each year (6 April to 5 April the next) that is at least equal to the amount of tax all the charities or community amateur sports clubs I donate to will reclaim on my gifts for that tax year. I understand that taxes such as VAT and council tax do not qualify. I understand OneKind will reclaim 25p of tax for each £1 given. Please treat all donations I make or have made to OneKind since 1 March 2010 and all donations I make hereafter as Gift Aid donations. I would like to hear more from OneKind and Hessilhead (tick box) about their work to protect Scotland’s animals. Your details will never be shared.